A couple of weeks ago a video went up on the Facebook page called 'Daqshekk ghall-Immigrazzjoni Llegali [sic] f'Malta', showing a group of black people beating another bunch of black people accused of witchcraft. This culminated in a group burning, with those running to get away from the fire beaten back into it with a certain glee that makes your blood run cold. 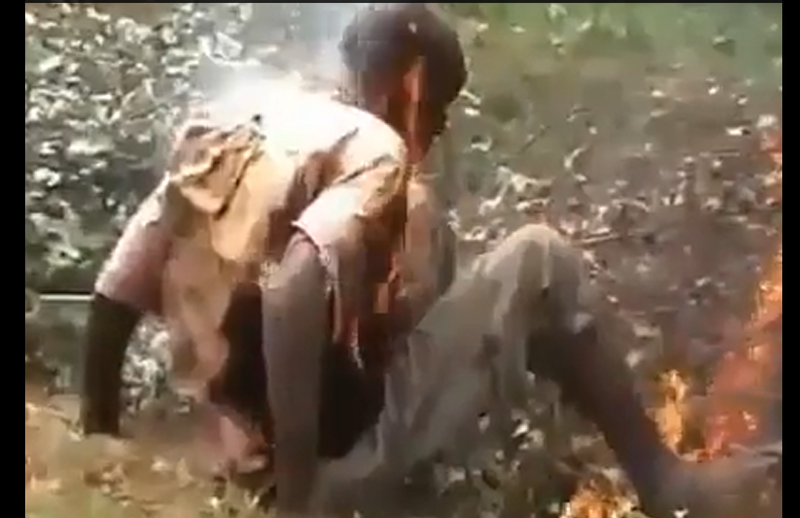 One man, half on fire, tries to escape, only to be drop-kicked back in. *Names of the immigrants interviewed have been changed to protect their identity. Li, Kev and Charlie are also modified names, subsequent to a formal request by the Office of the Information and Data Protection Commissioner, although visitors to the open Facebook group mentioned below can find them posting publicly. One particular image stuck in my mind – that of a man becoming progressively more black, in a kind of reverse-Michael Jackson phenomenon known as ‘charring’. This is not the effect of a skin condition or costly plastic surgery. The video is undoubtedly brutal and the perpetrators deserve the utmost condemnation, as the commentors were understandably quick to dish out. It is good to note that this incident happened in Kisii, Kenya, a predominantly Christian province in a Christian-majority country. We have yet to see him packing weaponry and a balaclava. What struck PATRON as interesting is that Li, Kev, Charlie and many others failed to make a difference between the blacks shown in the video committing unspeakable acts, and those that turn up on our shores. By their very reasoning, all whites should be tried for crimes against humanity vis-à-vis the Holocaust and the gulags in the U.S.S.R.. Our interest piqued, we determined to find out how the blacks among us would react to this video. Would they urge their savage brothers and sisters in burning the flesh of those accused of witchcraft? Are all the Africans in Malta still dreaming about the bygone golden eras of the Salem witch trials or the Inquisition? Driven by this simple question, we made contact with Asad, a youth from Somalia, next door to Kenya, and asked him to round up some of his friends so that we may see if they are indeed the ‘ħmieġ’ some people think they are. Meet Asad, Jamaad and Rugiyo. They’ve been in Malta for about a year. Asad and Jamaad are working as cleaners ‘quarter-part-time’ and are hoping to start attending MCAST next year, while Rugiyo is still attending secondary school and hopes to be able to do the same later on. A girl, Haweeyo, was also present, although she left early. She is working as a cleaner, though she holds on to her dream of being a nurse some day. Before getting to the video, we asked them about their lives back in Somalia, and why they left. Thinking about it, it’s a wonder the city still functions at all in this environment of fear, especially when you take into account that Malta comes to a standstill for an entirely peaceful election. Disarming with their simple way of talking, these youths – Rugiyo was only 13 when he got orphaned – have bigger cojones than most people their age – or of any age, for that matter – in the safer Western middle-class world. Their words are humble, but they belie a great inner strength that drove them to keep going when all they really had to hope for was to not die. Rugiyo and Jamaad took similar routes, through Ethiopia, Sudan and Libya (Haweeyo and Asad moved through Kenya instead of Ethiopia) before getting thrown in jail without charges, kept for a week, and thrown out like dogs on the street with only the very clothes they had on them. Eventually, they heard there might be a chance to escape the hell hole that was Libya in the midst of a civil war, and risked everything once again to cross the sea on a rickety boat, before making it to Malta and getting thrown into the detention centre, an experience Asad called ‘difficult’ and Rugiyo, who had by now impressed PATRON with a certain je ne sais quoi beyond his years, called ‘hekk u hekk’. The thing they rue the most from their experience in the detention centre was the lack of health service, with a doctor only available for one day a week and otherwise only brought after someone spent a couple of days in bed. Other ailments were simply ignored. No doubt, ’tis but a flesh wound to these hardy youths, but it should still be a matter for the authorities to look into. Turning to the video, I prepared them for something brutally violent. Their reactions upon seeing it were, surprisingly enough, almost word for word like those of the people who would shoot them ’14 miles out’ (as Norman Lowell infamously declared in 2005). ‘Savages!’, they exclaimed. ‘Animals! They are not human beings!’ Asad pointed out that, ‘if you have a heart, you can’t kill like that.’ Haweeyo simply turned wide-eyed, and forewent English altogether as she muttered something. The others explained, ‘She said she wants to vomit’. ‘I feel a sickness. It is like a knife in my heart.’ With words that brought to mind the plight of the Virgin Mary so beloved on these shores and a hijab covering her head, Haweeyo looked the part of a black madonna, suffering for all her wayward and afflicted children. It was a poignant moment, that made me feel for a second that asking her to watch this video was tantamount to abuse. In fact, she felt so bad watching the video that she simply left, unable to cope with the horrifying images in front of her. While the divisions among countries are rarely good things to put in the spotlight, it would be good for those who call all Africans ‘ħmieġ’ to take note of these differences. The Lis, Kevs and Charlies of this world who would have you believe that all blacks (even those who are descendents of those taken kicking and screaming from the frozen clasp of their mothers’ corpses to be traded as property worth less than an animals by whites who gave approximately zero shits as to the pain they were causing) are deserving of that moniker, should realise that as big a mess of a continent as Africa undoubtedly is, treating it as a homogenous whole only makes them look stupid. Even a black kid from Somalia can tell the difference between Greeks and French, and doesn’t assume all whites are the same – a fact that puts these supposedly enlightened people to shame. While many supposedly well-educated and enlightened people were quick to denounce everyone of a particular skin colour upon seeing the video, the people they were denouncing as ignorant savages denounced the actions and the people committing them. I would say it’s a fine line, but it isn’t. It’s a broad, thick line between generalisation and the ability to actually see beyond first appearances. That is, it is a concept pounded into us in every story from the New Testament to Shakespeare’s plays. What Malta does not have a place for isn’t individuals with a tough past and dreams of a better future. What Malta really has no place for is people who base their judgements on fear, and dress it up as hate. It seems that ‘don’t judge a book by its cover’ is a concept lost among many. These soon-to-be men have the same aspirations as the rest of us – though they do hold concepts like safety and peace in greater regard. Other than that, I ask you, what do you want for yourself, and your children? A good education, a good job that’s fulfilling. To be accepted for who you are and what your experiences have made you. Those are my answers. Your answers. Their answers. Finally, we get to integration. What makes them feel accepted here? What’s particularly painful? All of them agree that perhaps the most humiliating thing to happen to them in Malta occurs on buses. Imagine a bus, nearly full. There is a seat next to them, and a person comes to sit there…but when he notices they will have to sit next to a black person, they exclaim ‘qal madonni’ and get back. All four of them have experienced this situation, which, as you might imagine, makes one feel like a reviled outsider. And what about the opposite? What makes them feel like members of the community? I half expected them to say something financial, more help, a smaller house with less people in it. But their replies, their needs for an ‘integrated’ life, are simple, much like the rest of their expectations. ‘The way people look at you in the street. A smile. A nod.’ Eyes that don’t harden or look down, but that shine with acceptance. It’s these little episodes that make or break integration. It’s about meeting people and having positive or negative experiences. This requires tolerance and awareness among the Maltese of what those who come to our shores on those rickety boats have gone through – there’s no empathy without actual knowledge of the other’s situation. And for many of these immigrants, what Malta represents is nothing less than a new hope for a better future.